← Hacking Into…. A Wind Farm? 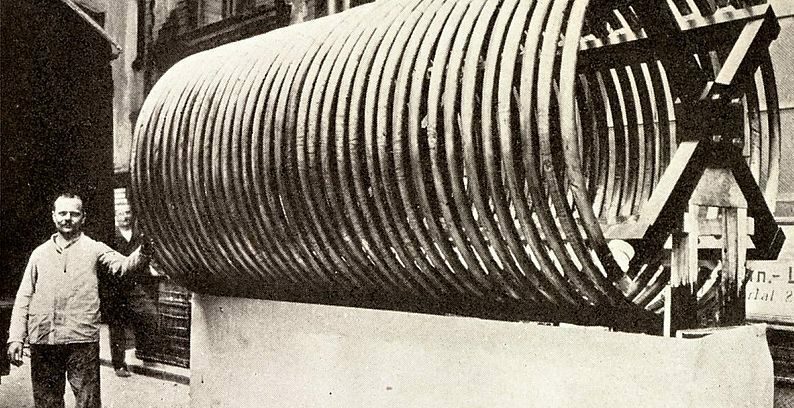 These large coils were used to cancel out antenna’s capacitance (making a resonant circuit at antenna’s operating frequency). A monopole antenna (such as mast) lower than ~1/4 wavelength will have large capacitive reactance, also short top-loaded antennas have it. With powers used at longwave/mediumwave/low shortwave transmitters (hundreds of kW) , where such antennas are used, a gyrator circuit probably won’t help. A gyrator isn’t useful when ENERGY efficiency is important — while a gyrator makes the current and voltage appear like another component, the energy stored (1/2C.V^2, 1/2L.I^2 etc.) (and recovered) is not emulated. For antennas, the intent of tuning is ultimately to improve power efficiency, and so a gyrator circuit won’t help there. I’m pretty sure that is not true. If the electrical specification (relationship between current and voltage) is the same, the energy flows will be the same. The difference of course is that the energy is stored into, and then extracted from, the power supply. If you want to build a 5H inductor using a gyrator and stuff a couple hundred amps into it, you need an op-amp and power supply that is capable of that power level. And sure, you can emulate a 5H inductor and it will work well at 20Hz… but the bandwidth of your opamp will limit the bandwidth of operation. You ain’t going to make a gyrator-inductor and use it in an RF filter at 100MHz – it won’t work because you’ll run out of gain-bandwidth product on the opamp. You can’t make a boost converter from a gyrated capacitor, or a charge pump from a gyrated inductor. Gyrators approximate the I-V relationships of inductors and capacitors for continuous signals, but the approximation breaks down if you apply discontinuities, like the switching in a boost converter or charge pump. You also don’t get any of the physical behavior deliberately ignored by the lumped-element model of electronics: you can’t make a transformer by putting two gyrated capacitors side by side, or a capacitive touch sensor from a gyrated inductor. Gyration is a useful technique, but discussing it in terms of passive components is only true for appropriate values of ‘true’. It dives into physical absurdity when you gyrate a resistor to get a negative resistance. it’s true. 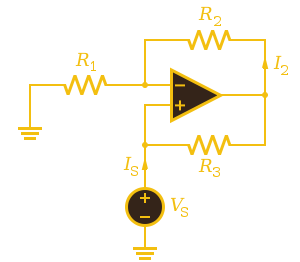 In a real inductor, you recover the (1/2.l/I²) energy stored in it when you reduce the current. In an emulated inductor, you don’t — generally (additional) energy is consumed from the power supply and associated op-amp-type circuits that emulate the inductor. Yum, Master’s thesis. Now just imagine how much ferrous material it would take to shrink that coil down. Monopole antennas don’t exist. Period. You mean of the coil or the original art? 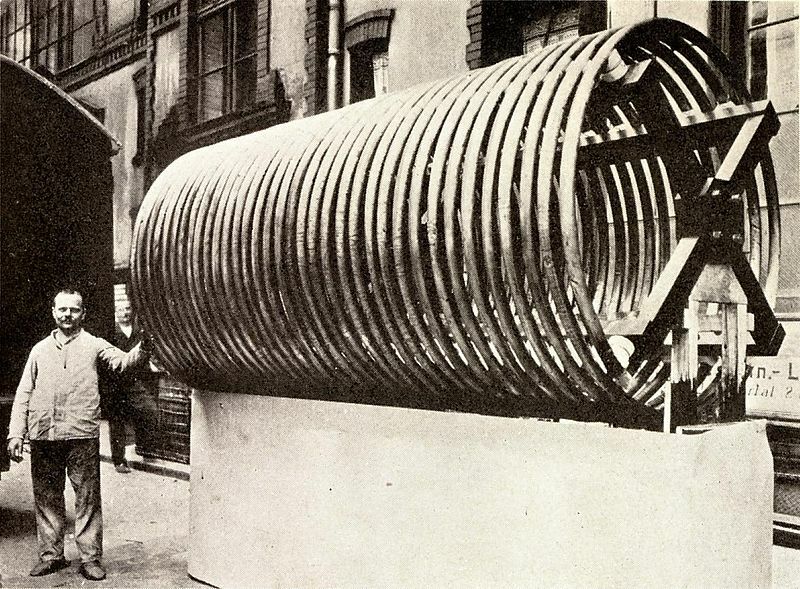 The original art is from an IRE proceedings from 1914: https://en.wikipedia.org/wiki/File:Large_antenna_loading_coil.jpg — now fallen into public domain. Cool. I’ll put that on the shelf next to my Wobulator. Have to keep it away from the coherer though. gyrators have been used in active filter circuits for ages. Nothing new here. They are often used to synthesize inductors. I read most of this article, now my brane hertz. I remember the early seventies, suddenly lots of talk about gyrators. 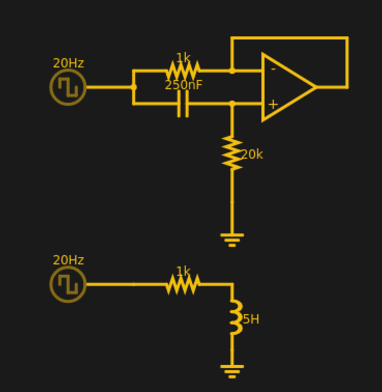 IC op-amps then making them practical. Various speculation about radio receivers without inductors, nobody giving thought to the need for wide bandwidth op-amps. About the only place I saw them was in adjustable equalizers, just replacing the very low frequency (and thus high value) inductors with gyrators. Active filters were a different thing, no inductors needed in the first place to replace. So I can’t think of many audio filters in hobby circles that moved to gyrators. Active filters took over. So all kinds of amateur radio gadgetry like narrow audio filters or radioteletype decoders that had previously used those ubiquitous 88mH toroid coils surplus from the telephone company moved to active filters rather than synthesizing large value coils. And nobody in hobby circuits went back to really low IFs in superhet receivers to try gyrators in the tuned circuits. Well since j is just Sqrt(-1) I have never been a stickler for X+jY vs X=Yj. In other words, j isn’t a suffix (like MHz), it is just a number multiplied. As for the j vs i, that is in the other post pretty clearly, I think. Didn’t mention it in this post, though. I prefer to keep the j before the reactance as it signifies that what you are looking at is a complex impedance and not some other algebraic equation or even simple complex number. I agree, this article had just the right mix of practical intuition and actual math. Good job! You are largely right. More focus on coding than math itself, thought they are not necessarily separate. Back in the 90’s a coworker of mine got really interested in DSP, which back then meant learning FFTs. Yeah but that stuff’s REALLY complicated. And for many many things you can do with electronics, particularly digital, you don’t need it. Especially in STEM, where you’re talking about educating people. Bringing in extremely complicated maths isn’t going to inspire people to pick up a soldering iron, but there’s so much you can do without the maths. It’s a good idea to keep the mathematics out of it. Most people aren’t cut out for it, and certainly don’t enjoy doing it. But if I started off slow, and eventually became interested in doing clever things with radio, say, I might eventually teach myself (or better, get someone to teach me) the maths. If I didn’t care about radio, and just used off-the-shelf modules, I’d be fine as I am. I realise that it’s not just radio that uses advanced maths like that, but it’s a popular use. Tempest Storm is my favourite old time gyrator. It uses a capacitor and a gyrator to form a compact high Q tank circuit between the antenna and the detector. They are tuned to VLF transmissions from submarine command and control stations that broadcast in the vicinity of 20kHz in the RF spectrum. FAR Circuits makes a bare board. I have one in my collection of projects I would like to build someday before i die. Excellent article, thank you! As a student majoring in microelectronics engineering, i especially appreciated the remarks about it’s usefulness in ic’s. I wouldnt have minded a little more math. ;). But i can always go learn more on my own. Plus it gives me one more thing to pick my proff’s brains about! Btw, benchoff would’ve written it better ;). Queue the troll stampede! …do you use them for building a Mooltipass? Our guy hasn’t quite captured Milla Jovovich there. Whether that’s deliberate so she doesn’t sue you, I don’t know. That said, setting the scene in the Egyptian temple got it completely right! The fifth, previously unknown, stone.